Use promo code WEBFRIENDS. Valid until August 2nd. Congratulations to the latest giveaway winners! Paula & Simone have each won a $25 gift certificate to Solo Para Ti. Thank you to all the readers who participated. Stylekid.ca is offering an additional 25% off all of their sale items. This is the shortest sale – valid today (July 30th) and ending tomorrow but well worth it. You can save up to 80% on some items. Go shop. Use code SUMMER3 at checkout. This is a great website with a comprehensive directory of indoor playgrounds in the GTA. Useful for the winter months ahead…and for this awkward summer. Thank you to Shira’s dad for sending the link my way 😉 You can help the directory grow by providing names of places that aren’t yet on the list and you can also add a rating. User friendly with an on-hand map…this is a one-stop shop for deciding where to go for indoor fun! Click on the the coupon and print! …and if you are switching over to glass storage containers, those have been discounted as well (but not by 50%). I am ashamed to admit that I haven’t printed one photo in the past 3 years. There are at least 100,000 photos of my kids organized neatly in folders on my computer and the thought of putting them in albums is so overwhelming. I think that photo books just might be the solution. 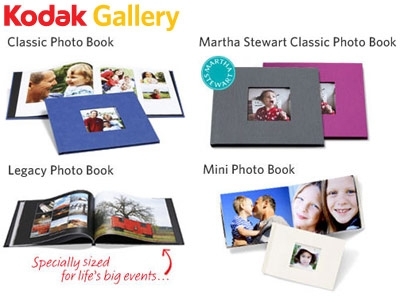 Kodak’s online store is offering 30% off their Classic + Legacy style books for a limited time. Use coupon code BOOK30. From Solo Para Ti: Peel & Stick Chalkboards + Mamapicks Giveaway! Solo Para Ti is a great home store in Richmond Hill owned by Allison who always has the greatest finds at competitive prices. If you need a special gift for any occasion and a convenient shopping experience, book an appointment to see her showroom which is open 7-days a week. While you browse, your kids can colour or watch TV on site. Gift cards are available and gift wrapping is complimentary! The website is but a small sample of what Solo Para Ti has to offer. Forget the hustle and bustle of the malls and make Solo Para Ti your go-to for all your gifting needs. Mamapicks readers receive 15% off any regular priced item until August 5th! …and now for the GIVEAWAY! Two lucky reader can win a $25 gift certificate for Solo Para Ti. Visit the website and drop me a line telling me which of Solo Para Ti’s products you would put on your wish-list. The first to write win 🙂 Winners must be Mamapicks subscribers. It’s Saturday morning and rain is in the forecast (probably). Imagine an hour strolling in the Art Gallery of Ontario or enjoying a crepe & chocolate coffee at the Art Square Cafe…while your kids are immersed in a fun painting workshop. Geared for ages 5-12, the Art Square Cafe (which is located right in front of the gallery) holds one-hour workshops for kids. $15 per child and materials are included! Every week, a new theme is explored and your kids get to learn a little bit of art history while trying a new technique. You can check out the themes and register here. I am a sucker for toys made of wood and for anything hand-made. 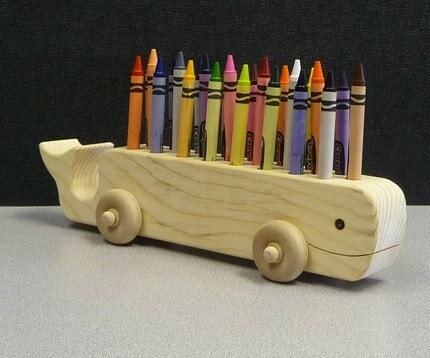 In my quest for great wooden toys, I found this amazing and functional little pine whale that holds 24 crayons. Hand-made by an an artist from Santa Barbara who has been making wooden crayon holders since he was 12! There are quite a few adorable crayon holders to choose from and the Crayola Crayons are included. Only $15 for the whale! Check out the store at Santa Barbara Crafts. The moment we’ve all been waiting for. 30% off at GAP, Old Navy & Banana Republic with this coupon. Four days only, starting this Thursday, July 30th. Click here for a true and tested excuse for getting out of work that day and bring a stroller (minus kid) for easy piling and shopping. I know this looks like a torture device…but really, this gentle gadget was one of the most useful things I bought when my daughter was an infant. Her nose always seemed to be full and when it came to feeding and breathing, it was very difficult for her to do both at the same time. With the push of a button, all that snot was sucked out. Other nasal aspirators require coordination and often don’t do the job. You can work this aspirator with with one hand while keeping your squirming baby still with the other. 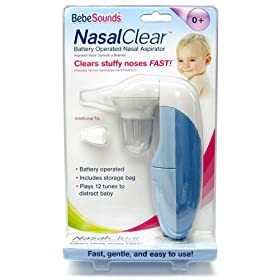 A little loud for my taste, but it gets the job done instantly and your baby can breathe again. I found this great product by BebeSounds at Walmart! There are many more deals, coupons and product features on mamapicks.com.. VIA Rail is back with a post-strike HOT promotion! Until tomorrow, save 60% on tickets purchased for all Canadian destinations for travel before Dec. 14th, 2009. It’s Saturday morning and rain is in the forecast (of course!). Imagine an hour strolling the Art Gallery of Ontario or enjoying a crepe & chocolate coffee at the Art Square Cafe…while your kids are immersed in a fun painting workshop. Geared for ages 5-12, the Art Square Cafe (which is located right in front of the gallery) holds one-hour workshops for kids. $15 per child and materials are included! Every week, a new theme is explored and your kids get to learn a little bit of art history while trying a new technique. You can check out the themes and register here. The moment we’ve all been waiting for. 30% off at GAP, Old Navy & Banana Republic with this coupon. Four days only, starting this Thursday. Click here for a true and tested excuse for getting out of work that day and bring a stroller (minus kid) for easy piling and shopping. Thank you to all of you who participated in our contest! Three lucky winners won a copy of The Nanny Toolbox. Congratulations to Jennifer S., Shana H., and Lisa K.! This just in from a dear friend (thank you! )…the Disney Store in Vaughan Mills is relocating within the mall and they are having a HUGE relocation sale! additional 75% off the lowest red-ticket price on all tween merchandise! additional 40% all other red-ticket merchandise! “buy one get one free” medium and large Plush toys! $5 mini bean bag plush! Happy Monster Band plush – wait for it! – 2 for $2.99! Disney Princess Darlings and Fairies Flutter Dolls – only $7! 4-pc stackable cups, only $10! Vaughan Mills exclusive girls and boys summerwear, only $9.99! I know this looks like a torture device…but really, this gentle gadget was one of the most useful things I bought when my daughter was an infant. Her nose always seemed to be full and when it came to feeding and breathing, it was very difficult for her to do both at the same time. With the push of a button, all that snot was sucked out. Other nasal aspirators require coordination and often don’t do the job. You can work this aspirator with one with one hand while keeping your squirming baby still with the other. A little loud for my taste, but it gets the job done instantly and your baby can breathe again. I found this great product by BebeSounds at Walmart! Happy 4th Birthday to sweet Noa! I love the candle on her cake… A big thank-you to Noa’s mom for sharing this great photo. If you would like a birthday announcement for your child on Mamapicks, please send me a photo and tell me a little about your cutie. Print out your VIP coupon and bring it along. I have never been to this sale but heard that it’s worth the trip for diapers, wipes, toilet paper and other P&G products. If you go, drop me a line and let me know your thoughts! I love this idea! A fabric bookshelf that hangs on curtain rods making books visible and inviting. This artsy mom of a 3-year-old was inspired by the amount of time it took her daughter to choose a book from a regular bookshelf. It’s important for kids to see the front covers of books and decorating a room this way conveys a very positive message about reading. 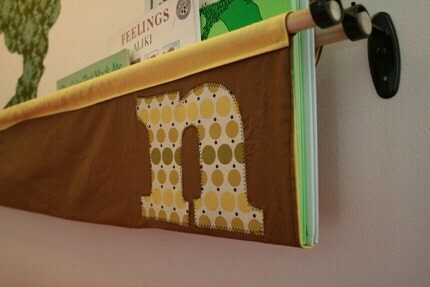 Different fabrics available and can be personalized with your child’s initial. Check out Penny Carnival’s Shop. Have I talked about the Shops At Donmills enough yet? This weekend (July 25th + 26th), the Town Square transforms into a play zone with a bouncing castle and obstacle course. The wonderful water fountain has turned into a great splash area for kids and it’s so much fun! Bring towels and a change of clothes. Last weekend, I took deep breaths at Anthropologie while my husband watched The Boy splash around (on a chair in the shade, mind you). A win-win! Family fun takes place 12pm-4pm on Saturday and Sunday. The Shops At Donmills has great family bathrooms located right next to the water fountain and Guest Services will happily warm up a baby bottle for you or provide an emergency diapering kit for $2. A new nanny arrives to help take care of the things you value most…your home and your family. Every family has a zillion routines and preferences that are not easy to communicate. Conveying all of this information to your new nanny can be a very overwhelming and time-consuming task. Lisa is a mom who learned from her own experience and created The Nanny Toolbox to help parents and new caregivers. The Nanny Toolbox is a digital family manual filled with schedules and forms that are designed for you to fill out with ease. From meal plans and feeding instructions to laundry and play date information, Lisa has thought of every possible detail. I think The Nanny Toolbox is BRILLIANT and have personally used it when our new nanny arrived. It helped me to stay organized, save time and alleviate a lot of anxiety! Mamapicks readers have a chance to win a copy of The Nanny Toolbox! It’s easy – be one of the first 3 readers to e-mail me the answer to this question: What handy poster is included with the Nanny Toolbox? Find the information on the website and write to me at info@mamapicks.com. Winners TBA July, 24th. I love this idea! 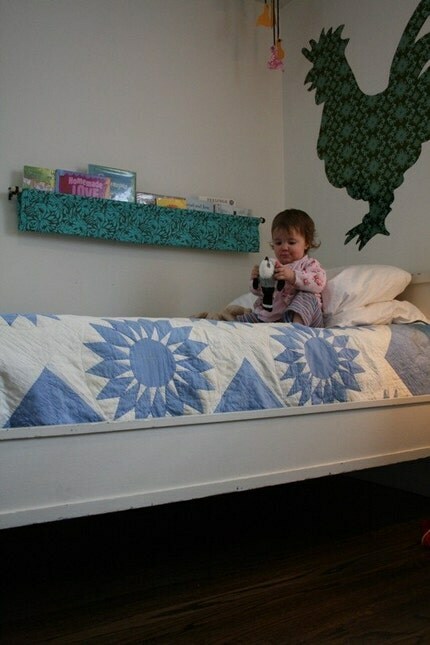 A fabric bookshelf that hangs on curtain rods making books visible and inviting. This artsy mom of a 3-year-old was inspired but the amount of time it took her daughter to choose a book from a regular bookshelf. It’s important for kids to see the front covers of books and decorating a room this way conveys a very positive message about reading. Different fabrics available and can be personalized with your child’s initial. Check out Penny Carnival’s Shop. On the last Sunday of every month, the Kensington Market area says good-bye to cars + traffic and hello to community and fun. Global action begins as this neighbourhood reclaims their streets. Come and enjoy local performers, musicians and artists. A little bit of pedestrianism in our beloved city is always a good idea. There is something so Europe about it! The streets are yours from 12pm-7pm on Sunday, July 26th. I have often used this website called www.kidscraftweekly.com where you can subscribe to get weekly craft ideas. The projects are great and don’t require a trip to Michaels. Crafts are such a great way to keep the kids busy doing something constructive and fun. True quality time!